Uttar Pradesh(UP) Chief Mayawati sacked four ministers, Rakesh Dhar Tripathi, Awadhesh Verma, Rajpal Tyagi and Hari-om Upadhaya. The action was taken after allegations of corruption against them and an in-house inquiry. Those who were removed were Forest Minister Fateh Bahadur Singh, Technical Education Minister Sadal Prasad, Haj Minister Anees Ahemad alias Phul Babu and Wakf Minister Shahjil Islam Ansari. None of them could be reached for comment as their phones were switched off. In another development, Ayurveda Minister Daddan Mishra, who was denied party ticket to contest from Shrawasti’s Bhinga seat which he represents in the Assembly, sent in his resignation. The BSP also dropped from its list of candidates Small-Scale Industry Minister Chandradeo Ram Yadav, whose removal the Lokayukta has recommended for working as headmaster of one school and manager of another even after becoming a minister. He represents Mubarakpur constituency in Azamgarh district. 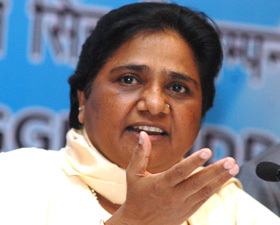 After Friday’s dismissals, the number of ministers Mayawati has dropped in the past six days has gone up to 10. The BSP has so far denied ticket to more than 80 of its 200-odd MLAs, including several ministers. Mayawati has called a meeting of party coordinators at her residence on Saturday to discuss the final list of candidates, sources said. In a statement, a BSP spokesman said the four ministers had been sacked to prevent them from misusing their official position and putting undue pressure on the people in the elections.